Yes, that title is terrible. I just couldn't help myself. Should I copyright it? I detest politics. I detest what it does to me, emotionally. I'm admitting to you all that I am immature in the respect that I can't reconcile the heated debate about ideas and concepts that ultimately becomes personal, divisive, mean-spirited, and cruel. I saw an interview program, a couple of years ago, where Bob Dole and Bill Clinton, post election and post-presidency, gushed on and on all over each other with admiration and praise, joking like old war buddies. I was flabbergasted. I so wish that they'd shown one iota of respect for each other during their incumbencies. That was disgusting to me. I'm also, then, admitting that I'm naive in the ways of the politico, growing up in a household where people were pretty transparent. I have been the victim of this naiveté a couple of times in my career; I have also held steadfastly through those events to the principle that I'd rather be me than 'them'. So, independent, naive, immature citizen that I am, I find myself seemingly in the midst of a dilemma. I asked Sam to watch Barack Obama's acceptance speech, last night. I told him that it was a historic occasion, and that he could tell his Grandchildren that he'd witnessed it. He shrugged and complied with all of the enthusiasm one would expect of a nearly 12-year old for a speech from any adult. The best news for me was that it was no big deal to him, an African-American earning the candidacy of a major party for the Presidency of the United States of America. He hasn't really grasped what it means to me, to us as a society. With any luck, the event won't ever have to bear the weight for him that it does for me. Emma has changed just about every aspect of my existence, my personal political views, too. Here's a bit of it, in a nutshell - and I do mean nut. I've already told you that I'm immature and naive, so either keep reading or dismiss yourself. I've always seen the Republican view as one of both personal responsibility and public compassion. The current party's representation to me has been merely selfishness and greed. While the Bill and Melinda Gates bunch are being generous with their more-than-we-could-ever-spend fortunes, I'm pretty sure that the bulk of those between those like me and those like them are keeping the money to themselves. The Bush administration (small a) has been myopic with its policies, unwilling to even participate in a reasonable dialogue with the electorate in a dogmatic march that poorly represents both their supposed faith as well as what it means to be citizens of this republic. "Corporate Responsibility" is a sham. When HMO CEO's have million-dollar golden parachutes while denying ten-thousand dollar claims, our society is severely awry. You see, to me, leadership is about servanthood. I've not been a huge fan of increasing government assistance or expensive social programs. Well, guess what? I need them, now. One lower-middle class income is not going to provide well for either of my children's futures. My bootstraps are busted. So, does that make me a Democrat, now? Perhaps. Should I be practical, or philosophical? Can I be both, or none, or something in-between? Yesterday, John McCain chose Sarah Palin as his running mate. Gov. Palin has a four month old son, Trig, who has Down Syndrome. 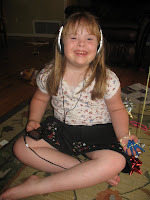 She has been an inspiration to many of us, confidently revealing that she knew about the Trisomy 21, did not abort him, and describes him as "perfect." I am, frankly, saddened by how many parents in my little community have just unabashedly thrown their support to this ticket based upon that one reality. Perhaps, true Republicans, they just needed this perk to justify their own dilemmas. I don't think that it's enough; that this should be the deciding factor about how I cast my vote. No more than voting for Barack Obama due to the color of his skin. To finish the thought, yes, it's about the content of their character. I'm convinced that our government is sick. It wallows in the throes of it's own bureaucracy, rules, and party machinery. To morph what Benjamin Franklin said at the signing of the Declaration of Independence, we are all now hanging separately. Necessary change idles while resolution after non-binding resolution are passed like gas and the bad checks that they're writing against the future. Will freedom become "just another word for, nothing left to lose?" It's beyond my scope, but I feel a need to influence it, if only by my one vote. That's my responsibility. So, just by stating my thought processes, have I set myself against you? Have I convinced you of anything? I hope the answer to both questions is "No." I sometimes envy those who have a clear grasp of the world, how it should work, and passionately drive themselves and others toward that vision. Problem is, it usually means that someone else gets trampled or left behind. I think that's the ultimate American (US) dilemma - Freedom vs. Responsibility. I'll let it go, at that. I just hate politics, that's all. In another life, I was a data-driven TQM, TQI number crunchin' fool. I don't particularly like statistics as a discipline (it requires discipline), but I do like goofing numbers around when the data suits me. I took the raw logs from my beloved tube system for the month of July, and learned some interesting things. O.K., not interesting like guaranteed winning lottery numbers, interesting like "hey, look at that! Let's eat." This post is dedicated to Nick, and his, er, seemingly indefatigable interest in this subject. I still don't know why. I have to say that the repair that made all of the difference occurred on July 15, the middle of the month, so the data reflects both an ailing and a healthy system. I'm going to run these numbers again, for August, but I'll probably only share them with Nick. But let's not delay the suspense, any longer. . .
118 Returns (0.65%) - a little more than 1/2 of 1% were sent back due to some system problem. Nearly always just resent, then they go. For a mechanical system run by a PC running Windows NT 4.0, I'd say that that's pretty good. (this improved dramatically after 7/15, when the pressure/vacuum tripled). 63% of transactions were either to or from the Lab. 28% of transactions were either to or from the Pharmacy. That makes 91%. That's a lot. See? The hastily drawn chart, below, shows the volume of traffic by time of day! I think it's interesting that, with only a couple of spikes, the traffic is rather constant. Lots of body fluid samples, lab results, drug orders and drugs whizzing back and forth, all day, all night, Mary Ann. Well, those are the highlights, Nick old man. I don't think anybody's really realized just how busy this thing is, and how it's really serving these two departments so well. Kinda like one's sewer system (Kelly!) - you take if for granted right up to the moment when it stops working. I'm hoping it will spur the powers that be to up the ante on the stuff that needs to be upgraded on this thing before it 'craps out' , someday. "Elbog, how could you defile your Mac with Vista? That’s like eating Chinese food with a fork." Diversity. It's appalling to me that, even those in our community could project such a jaundiced and callous view such as this. Can you believe that someone would say something so spiteful, when we're all trying so hard to support each other? Well, TOM, I'm going to tell you why. I eat Chinese food with a fork, too. I'm not Chinese. I've learned to cook Chinese food, and using a fork is the most economical way that I've learned to shovel it into my mouth (and after all of that chopping and wok-ing over a large flame, I'm pretty stinkin' hungry). I feel that I have gained an appropriate appreciation of Chinese culture by this means, and I certainly have and can use chopsticks, and certainly would if I were a guest in a Chinese home, but I gain no sense of world-citizenessness or edumacation dining at home with them. It's a tool. That's answer #1. #2> It runs GREAT. There's nothing wrong with Vista, they just pooped in their own messkit by not being clear about what hardware it would run on. I've read that it runs better on an iMac than just about anything else. I'll testify to that. #3> I do because I can. I earned free, legitimate copies of Vista and Office 2007 at about the same time that my old PC, cobbled together/upgraded/etc. since 2000 was showing some strain. I was frustrated by the fact that PC pieces don't always fit together so well, anymore, and the cost of a new machine with the specs I wanted faced me with some complicated choices. Mac, of course, solves that by controlling the process and also more than doubling the price. My way, the highway, and thanks very much. It's very much like many other religions I've seen. The iMac was a generous Christmas gift this year; the timing was right, and the Boot Camp software made it easy. I took the road less-traveled. #4> I'm a guy who's known DOS, Novell, Arcnet, token-ring, the command-line. I saw the original Mac, it was cute, but I like taking the back off stuff and making it better, you know, the smell of burning silica. My only complaint about my current Mac is that I can't upgrade the video card. That's whining, and I won't do it again. I currently have 3 drives, 2 keyboards, an extra monitor plugged into it and enough wires strung around to keep me happy and busy. It's workin' out o.k. #5> There's always been a Mac in the house, and I've gained an appreciation for it's ease of use, sometime's obtuse but simple-minded interface, and plain reliability. I have OSX installed on this baby, too, so I get the advantages of both platforms - goofing off in Garage Band and IMovie, although, due to my lack of constant practice with Mac commands, they often prove to be just as frustrating as any other software I've ever used. No faster. I think that the competition has really brought these software giants to a point where there's not a whole lot of difference in how the average user interacts with it to do stuff. That leaves the specialties to divvy up the rest, depending upon certain preferences, features and hardware/industry history. I spent a couple of weekends with Ubuntu, last year, too. I found it to be just as challenging to set up and use as Windows, albeit for free. I somehow would rather pay for that pleasure, kinda like you eating Chinese food with chopsticks, Tom. Sorry, that was a cheap shot. I'd add that, for example, neither platform has provided an easy way (read free/cheap/tweakable) to integrate the home network to my television set. They both approach this from annoying, proprietary angles that, well, annoy me. In summary, I'm a PC. And I'm a Mac. And I'm proud to be both. I'm not here to judge any of you inferior, I'm just asking that you please re-consider your old ways, fueled by multibillion-dollar corporations and perhaps your own pride. If you can't, that's o.k. I admire your French-film watching, knees-bent, running around maneuvers and such; if you require a sense of superiority, then so be it. I'll still be your friend. And that's how I like satire. If you're not laughing, then I've gone horribly wrong. I think this about does it, for me. Patricia Bauer is a professional writer. There's been so much written about Tropic Thunder - although I'm curious as to how much those of you not living in my world have actually seen of it. Ms. Bauer wraps it up, very well, with this piece. I'd rather you read it than for me to tackle it, poorly. If you've got the intestinal fortitude to read it all, note the sections that she finds terrifying. These are the things that keep me up at night, not the name-calling by wealthy dilettantes. Margaret's amazing to me, do I dare dream the same things for Emma? I turn 50 next year, she will be 10. I've posted some mighty wicked replies to about 15 blog and forum posts over the last 10 days or so. Diverse community that we are, there have even been several discussions reminiscent (perhaps only to me) of the Sermon on the Mount scene from "The Life of Brian." Cheesemakers, indeed. The right of free speech, the limits of same. Responsibilities and where they ultimately lie. My online friends have argued with each other, with radio and TV wonks; some have argued with themselves. They've picketed and protested, and fractured and frittered - it's all part of any 'movement'. I'm utterly convinced that those responsible for this film had absolutely no intention to cause this eruption. As Ms. Bauer points out, that alone is at the crux of the problem. I've railed at one friend already about the state of the industry. Read this book, "Vulgarians at the Gate" by Steve Allen - wow, a celebrated comedian - if you want more. The treatment of the disabled is only one signpost on the slippery slope we're on. Did I mention that I'm almost 50? Get off my lawn. Anyway, Patricia hits all of the highlights, with skill and heart. My sincerest thanks to those of you willing to engage yourselves for the betterment of my Emma's world. That is what the blather's all about. So, I've been 'tagged' by my very good online friend, Kelly at Where there's a Will. It's called a meme although, having just looked it up, I'm tempted to quote Inigo Montoya in "The Princess Bride" - "that word you keep using, I don' think it means what you think it means." 1. I avoid cracks and seams when walking on concrete. 2. I prefer to eat peas mixed with mashed potatos. 3. I will eat Prime Rib with ketchup, if given the opportunity. 4. I despise dog spit even more than I despise dog breath. 5. I like orange cake with orange frosting. 6. I will turn all of my socks right-side-out before putting them away. 7. I don't play tag, anymore. 4. Tag 6 fellow bloggers by linking to them. 5. Leave a comment on each of the tagged bloggers blogs letting them know they have been tagged. Truth is, I don't know if I could come up with 6 people to tag, Kelly'd have to be one of them. And that would be copying, or shall we say, meme-ographing, as it were. And yes, I realize that half of my quirks are about food. Yep, they are. I don't ask for a lot, at least I don't think I do. Please don't spend any money on the movie "Tropical Thunder". Read some facts, if you want to. Then don't go. If you're of a mind to, ask your friends not to go, either.